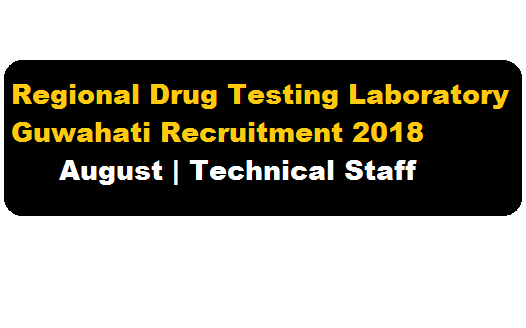 Regional Drug Testing Laboratory, RDTL Guwahati Recruitment 2018 August | Technical Staff Positions :- The Ministry of Health & Family Welfare is implementing National Tobacco Control Programme throughout the country. Under the Programme, National Tobacco Testing Laboratories is being set up at Regional Drugs Testing Laboratory (RDTL), Guwahati. According to latest RDTL Guwahati Recruitment 2018, Director, Regional Drugs Testing Laboratory (RDTL), Guwahati invites applications from eligible candidates for the following contractual posts to be engaged at the National Tobacco Testing Laboratories, Guwahati within 15 (fifteen) days of the publication of this advertisement. In this section, we will discuss in detail about Recruitment of Technical posts under RDTL Guwahati Recruitment 2018 August with all the details and requirement. Essential Qualification : M.Sc. with Ph.D in Chemistry/ Analytical Sciences/ Instrumentation/ studies related to tobacco and tobacco products. Desirable : 3 years research experience in natural products/ synthesis/ analysis of organic compounds/ bio-chemical/ pharmaceutical sciences. Job Description : To plan and execute analytical work. Essential Qualification : M.Sc or B.Sc./B.Pharn with three years of experiences in chemical/ physical/ biological analysis/computer applications. Desirable : Experience of operating analytical equipment. Job Description : To carry out analytical/synthetic work and to prepare relevant technical reports. Eligible candidates shall be required to submit application for the post to be applied in prescribed format uploaded in the website: www.cdsco.nic.in and www.cdsco.gov.in with self-attested copies of certificates of qualifications and experience to The Director, RDTL/NTTL, Guwahati at the above address by post. All original documents must be brought for verification at the time of interview, if invited. No TA/DA will be paid for attending the interviews for the job applied for. Govt. of India, Six Mile, Guwahati-781022.